Free fun for young and old, this trail will guide you around York. Highlights include Clifford’s Tower, Shambles and York Minster, plus lots of cats! Pick up a trail leaflet in store, have some FREE fun in York, see the sights and find the cat statues on our self-guided tour. The trail starts at The Cat Gallery shop and takes an hour or so. If you have a little longer, it is well worthwhile adding cats 20-22 onto your itinerary. They will give you a stroll through the delightful Museum Gardens and a walk on the City walls with wonderful Minster views. Download the York Cat Trail guide here. 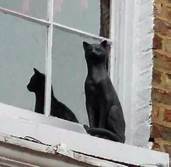 The history of the cats in York dates back to 1920, when Sir Stephen Aitcheson placed two on a building that he owned in Low Ousegate. Some say he put them there to scare away rats and mice though it’s more likely that he thought they would be eye-catching and attractive. Others followed his idea and the odd cat appeared around the city in the hope that good things would happen!